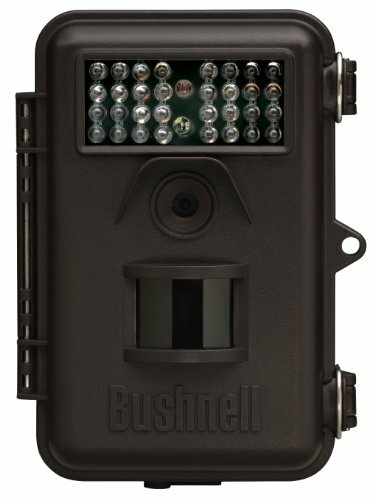 Bushnell Trophy Camera Standard Edition produces good quality photos with its 8 megapixels resolution. It offers adjustable resolution options of 3, 5, or 8 megapixels. Three megapixels has low light and fast moving critters that won’t produce the streaks seen at the higher resolution. The camera’s video size is limited to 640 x 480 or 320 x 240 at 30 frames per second. You are not going to capture high-definition footage for video recording, but it includes the audio of the video which has a high quality. This trail camera can take photos at night with 32 LEDs and an invisible flash that has a range of 45 feet. The PIR-auto sensor will automatically detect any motion within the detection range. Its PIR-auto sensor is adjustable to low, medium, and high setting to have a match in the environment. It can capture high-quality images during daytime and nighttime. This Bushnell product trail camera operates with a set of four batteries, but there are eight slots inside the battery compartment for the camera to work longer. If you prefer another source to power this device, it also supports external power sources. Bushnell Trophy Camera Standard Edition offers a field scan time-lapse mode that has a simultaneous live trigger. This camera mode can take pictures automatically at pre-set intervals and allows you to monitor all the movements within the detection range. There is no active movement required as the recording takes place with your choice of an interval during the block of time that you have set. This camera feature allows you to keep track of areas that are outside the range without interfering the live trigger. The camera’s casing design is intended to be weatherproof, and you can use it in any weather condition. This trail camera is a reliable and feature-rich piece of equipment. It is capable of capturing still images of up to 3264 x 2448 in size with 8MP image resolution. It has a feature that you can record videos with excellent quality audio of up to 60 seconds in length. Its invisible PIR flash has a wide range of 45 feet. This is a weatherproof device and which can resist during any season of the year especially rainy and snow season. The PIR-auto sensor motion has three levels. It offers a programmable one to sixty seconds of triggering intervals. It is equipped with the field scan time-lapse mode. The batteries can last up to 1 year in the right condition. This trail camera offers a fast trigger speed. It offers multiple settings for image resolution. The camera is easy to set-up. The lighting conditions that the camera offers can baffle the sensors, and it will result in photos with red, green, and blue casts. The camera’s flash can automatically catch the eye kind of something flitting by. The invisible IR flash is quite visible as dim red. If the camera is set to 5 or 8-megapixel resolution, a streak can occur in low light with fast moving subjects. You have to tape the battery cable cover shut, so ants do not get in. Some of the pictures are blurred. This trail camera is powered by 4AA batteries but has eight slots inside the compartment. It is also an external power compatible. It can be placed on any tree stand with an adjustable web belt and 1/4-20 socket. It has a product dimension of 8 x 10 x 2.5 inches and 12.5 ounces. It has a shipping weight of 1.1 pounds. The weatherproof construction feature prevents the rain from soaking in. It has a temperature range of -5 to 140 degrees Fahrenheit. 32GB SD memory card supports it for its ample storage. This device offers widescreen, VGA, and QVGA video resolution with audio. You can get cheaper trail cameras to do your wildlife research if you are just aiming for average quality of images and videos. Bushnell Trophy Trail Camera Standard Edition falls into a price class that will persuade you that it is worth the investment because of its features and benefits. A cheaper device is not a problem, but if you want to ensure that you won’t miss any shot, then Bushnell is worth the extra expense. This trail camera is a little bit costly, but its value compliments well with the outcomes of its resolution and specifications. The satisfaction that the camera can give to the user is worth it. With the high-definition pictures and video, this trail camera is highly recommended to use in any wildlife research. Bushnell Trophy Trail Camera Standard Edition gives you value that suits the quality that you’re searching. This game camera is designed to be used in outdoor activities to endure extreme weather conditions. This camera is for the researchers and hunters who need convenience in their research. House people may also be the best customers for this camera as it can also be used as home security surveillance. The one who aims a high quality of images and who needs audio for their video research is the perfect buyer for this trail camera. It can be used for any indoor and outdoor activities. Bushnell Trophy Camera Standard Edition suits to everyone who needs high-quality images for their activities. Bushnell may have a cost a little bit expensive but considering the features and benefits you may get from it makes it very affordable. This camera is best recommended for everyone, especially for wildlife hunters. The durability, detection range, PIR motion sensor, image quality, and the weatherproof feature will let you experience convenience in using this trail camera.